Gastric bypass surgery cost less at this Specialist Hospital in France. A gastric bypass surgery is normally performed to reduce the size of the stomach by as much as 90%. A normal stomach can stretch, in some instances this may have been stretched to a capacity of over 1000 ml. There are two version of Gastric ByPass Surgery and the method adopted will vary depending upon which ByPass procedure is recommended by the surgeon following your consultation. The Surgeon will recommend either "Roux-en-y" Gastric Bypass surgery or a "Omega Loop" Mini Gastric Bypass. 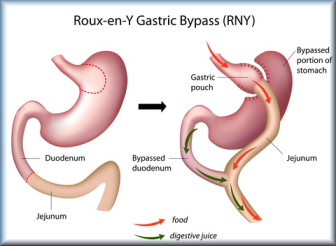 In the case of a "Roux-en-y" gastric Bypass surgery the pouch may be as small as 15 ml. Because the stomach pouch created by the surgery procedure is normally formed from the area of the stomach which is least susceptible to stretching. Due to the smaller size of this pouch area any significant long-term change in pouch volume is prevented. The "Roux-en-y" Gastric Bypass is preferred where there is a history of gastroesophageal reflux and to avoid anastomotic ulcers. However, there is a possibility in the long-term of the ability of the small intestine to hold a greater volume of food over time Also the functional capacity of the small pouch can increase slightly. In most cases following gastric bypass surgery, by the time these changes start to take effect, sufficient weight loss has already occurred enabling the patient to maintain a lower body weight in the future. 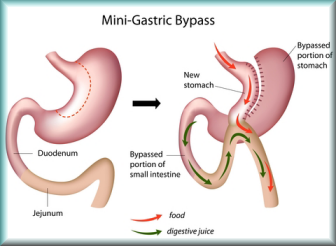 Mini gastric bypass surgery is a less invasive procedure than "Roux-en-y" gastric bypass surgery. The surgical procedure is performed using a laparoscope. The surgeon forms the stomach into a narrow tube, which is then attached directly to the small intestine about six feet from its starting point. This then allows any food to bypass the initial highly absorptive initial section of the small intestine. The Omega Loop version (mini) generally gives a better result after 5 years with better physiologic control of the weight loss and glycemic/Diabetes control. An additional benefit of a Mini gastric bypass surgery is that is theoretically reversible which is an advantage when compared to other weight loss surgeries which generally require much more post-surgery attention. The ability to reverse the mini gastric bypass is a great advantage for people who are not recovering well or responding well to the surgery. In these cases, the patient can get the surgery reversed and resort to alternative weight loss options. How Much and How Fast will I lose Weight After Surgery? You can lose up to 85% of your excess weight after a by-pass. Weight loss is the fastest in the first 3 months and the rate reduces thereafter. You should continue to lose weight for a year and a half until 2 years. After that, the body stabilizes and does not lose weight further. However exercise may help you lose the rest. To gain the maximum benefit from any gastric bypass surgery, it is important that the patient eat only at regular meal times consisting of say 5 to 6 small meals daily, and avoid eating or snacking between these meals. The danger of not following these suggested rules following any bariatric bypass surgery is that the patient can over time effectively circumvent the benefits of the by-pass altogether. The entire gastric by-pass or Mini Bypass procedure is done laparoscopically, where laparoscopes are used by the Surgeons to gain access through the abdominal wall through small surgical incisions. There is virtually no scarring. There are usually 6 small incision marks on your tummy. The largest one is about 1 cm. These marks will fade away over time. What diet restriction are there Following Surgery ? You will need to be on a liquid diet for approximately 15 days after the surgery. This is followed by 15 days of semisolid foods and then you progress onto solids. Within 2 to 3 months you can have most kinds of food although in limited quantities. Please note that sweet intake should be kept to a minimum since it could lead to ‘dumping syndrome’. Patients are also required to take a nutritional supplementation following surgery to ensure a balanced diet intake is maintained and a higher quality of Life after Gastric Bypass Surgery. 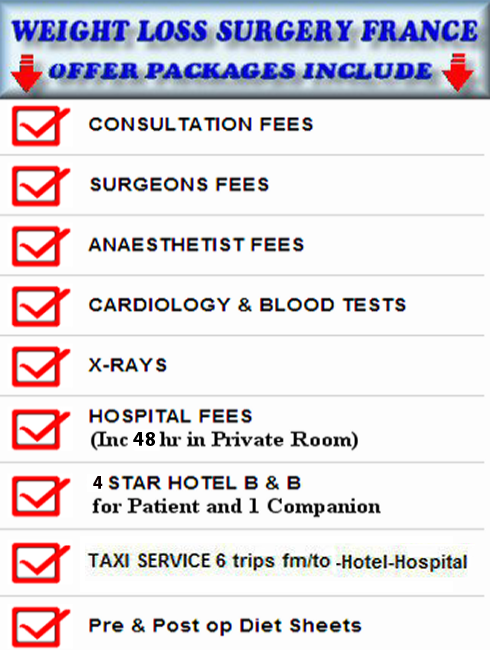 Are your Surgeons Registered to perform Gastric Bypass Operations.